Casino International | Will Ladbrokes Move Into The USA? Casino International > Industry News > Will Ladbrokes Move Into The USA? Ladbrokes holding firm GVC are desperate to expand their offering in the US market as more states edge towards legalising online gaming. The bookmaker is one of the world’s household names and rumours have been circulating for some time that Ladbrokes will join the likes of William Hill in releasing their offerings in the USA. It would be a huge move for GVC, particularly if they also drop an app alongside an online package. Ladbrokes app review articles are hugely lauding the firm and get a slice of the American pie and that could be huge for the business. The company are keen to boost profits after an £18.9million loss last year, while the change in law to lower the maximum bet on fixed-odds machines will also mean seeking profit elsewhere. GVC have already managed to secure a deal with MGM on a sports betting deal worth $200million as they look to follow William Hill and Paddy Power Betfair. The deal struck sees a joint 50-50 venture between GVC and MGM called Roar Digital and it could pave the way for Ladbrokes to also move into the likes of the New Jersey and Nevada markets. 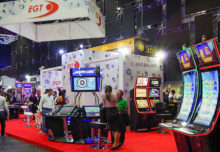 Ladbrokes have seen online net gaming revenue rise 19% in 2018 and Kenny Alexander, chief executive of GVC Holdings believes the business will continue to thrive over the next year, particularly as its American offering expands. Alexander said, “I think we are in good shape. We are winning at the moment and we expect to continue winning in 2019. “We are quite bullish about the UK. I think people doom-monger about the UK because it’s used basically to cover incompetence and under-performance. That’s my view on it. The opportunity in the USA is going to see Alexander aggressively pursue it, particularly as the likes of New Jersey are seeing record numbers of wagers in recent months. Their reputation will undoubtedly help as the Ladbrokes and Coral name have become household names across Europe. When that will happen, that’s unsure. However, 2019 will see the GVC brand go toe-to-toe with the likes of William Hill as the likes of New York and other states edge closer to legalisation of sports betting and online wagering. Alexander added, “We’ll be aggressive when new markets open up there,” before claiming that it won’t be a “drain on our financial firepower”. It’s going to be a huge year for online gambling in both the UK and USA and Ladbrokes and GVC are going to be at the very heart of it.